After a sleepless night, I was sitting at the front seat of an MTC bus headed to Ambattur from Broadway. I love the design of MTC buses – very functional and fairly spacious. Just as the bus approached Central, I receive a call on my phone – an interview that I had attended in Bangalore was positive. Now, that was the icing on my cake – two job-offers together, and it was no secret that I chose the one I felt was the best. I now had to head to Bangalore to take up my new assignment. A quick round of calls to my family followed, and I confirmed to my new employer in Bangalore that I would join them at the earliest. The hunt for a ticket to Bangalore just began. I browsed the KSRTC website over phone and found that tickets were available. However, due to the awfully low speed on the GPRS connection, it wasn’t a very good idea to book over phone. I called up my brother in Bangalore, and he booked the tickets for me. 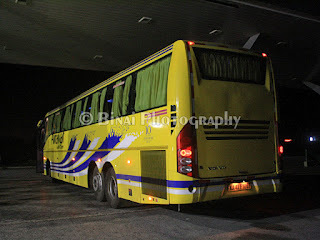 The bus was the 1530 Chennai-Hubli Airavat Gold Class. Jayasankar had called me and he was to join me to carry my heavy baggage to the bus station. He joined me for lunch, and we started off from Central after lunch. We decided to head to Broadway, and take a bus to CMBT from there. The bus to CMBT from Broadway runs via Central, but getting a seat at Central is difficult. Not wanting to take chances, we took a bus to Broadway – it was a Marcopolo. Once at Broadway, we began searching for the Volvo to CMBT. The Broadway-CMBT route (#15B) is very busy and there are buses throughout the day. 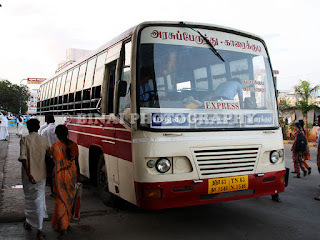 I headed to the timekeepers’ office to enquire if there were any Volvos to Koyambedu (CMBT – Chennai Mofussil Bus Terminus) at that time – the officers kept pointing at the next counter, and finally the last counter pointed back to the first counter. This was sure to become a vicious circle and hence I dropped the idea of searching for a Volvo. We got into an ordinary bus and took the first row seat. The conductor was adamant that we buy luggage tickets. The bus ride from Broadway to Koyambedu CMBT took about 45 minutes – was fairly fast. We reached CMBT at around 1430hrs – an hour left for my bus. The Bangalore bound buses of KSRTC are parked at the far end of Platform-1. At the departure area, there were about two Airavats, one Rajahamsa and my Airavat Gold Class parked. The Airavats were to Bangalore, and Mangalore, while the Rajahamsa was to Madikeri (via Bangalore). My bus – KA-42-F-1067 – had arrived from Hubli only about an hour ago. The crews were still relaxing in the bus after their long drive. Around 1500hrs, the drivers (the bus had two drivers and one conductor) were busy cleaning the front windshield and filling water to the windshield washer tank. The conductor rushed off to their office to get the reservation chart. 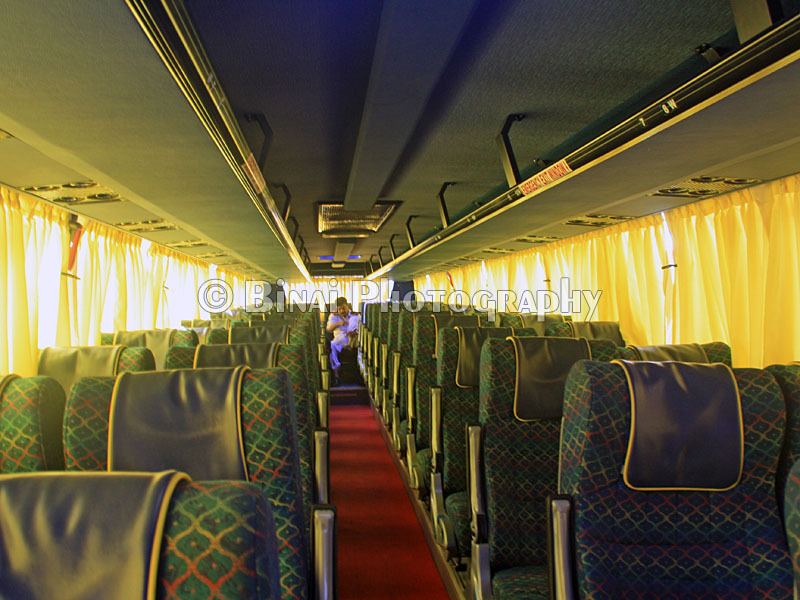 The crew were really friendly, and they allowed me take a couple of images of the bus before boarding started. Boarding commenced at 1515hrs. 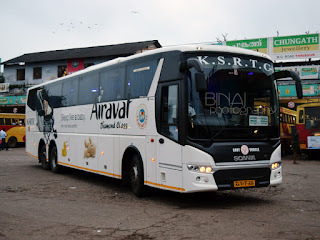 By now, the other two Airavats had left, and there was on Express parked in the place. There were about 20 reserved passengers, and the conductor managed to get in about 6 more passengers. The bus was pretty young – about 39000kms on the odo. It was well maintained – clean both inside and outside. Most passengers were curious to know what was special in the Gold Class. The Gold Class is basically an Airavat with two axles at the back. 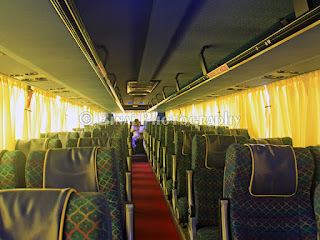 The bus has 53 seats, as compared to only 49 in an Airavat Club Class. The seats in Airavat Gold Class do not have calf support, and have lesser angle of recline as compared to the ones in Club Class. The leg space is tighter as well. 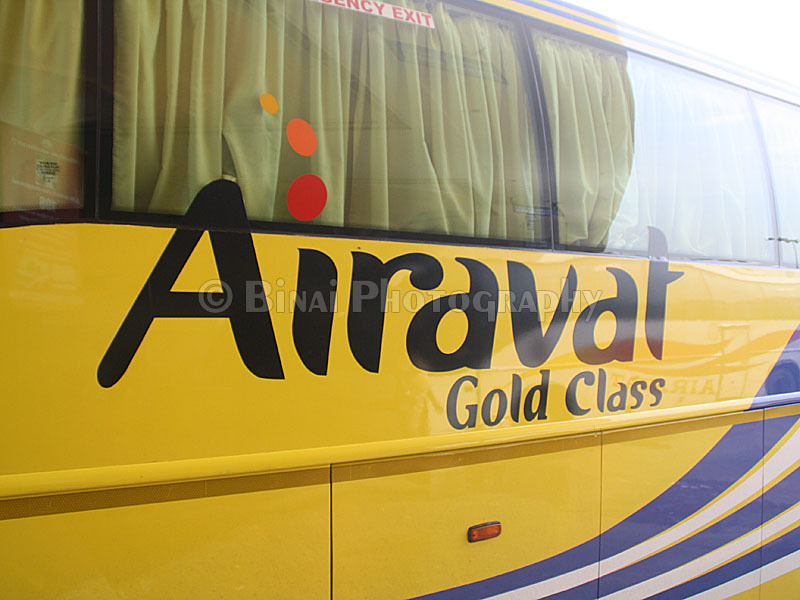 The only speciality of the gold class is that it charges less than the club class, but more than a regular Airavat. Inside the bus. The blue-green upholstery doesn't really go well with yellow curtains. A brown/dark-red theme would've been great. The bus started moving at 1533hrs – three minutes past scheduled departure time. Just as the bus got moving, the second driver came up and pulled down the near LCD screen. A bollywood movie was played. The second driver headed to the last row to sleep – this guy would drive the night portion of the journey. The guy at the wheels was well composed – a very stable style of driving. The conductor distributed water bottles to passengers soon after the bus got moving. Blankets are not provided for the Chennai-Bangalore leg. The progress until Poonamalle bypass was painful – crawling most of the time. One point that I liked was that the driver was gearing the bus properly – he did not lug the engine anytime, and kept using the appropriate gear every time. The driver got a bit relaxed after we crossed Poonamalle bypass – but the top speed never exceeded 80kmph for quite some time. The engine did not sound strained – meaning the gearing was proper. The movie was played at low volumes – comfortable enough for people to sleep. All the window seats in the bus were taken. When the passenger in the row ahead of mine reclined his seat to the maximum, I struggled a bit to find space for rest my leg. The leg space was the sole negative point about this bus. The driver increased the top speed to 90kmph now, and consistently maintained the speed. Lane changes were properly indicated, and he used the horn to the bare minimum. There were no rash cuts or sudden braking – a very disciplined driver, I must say. The run was eventless – the bus just kept running at the right gear, at more or less a consistent speed. We crossed Vellore at around 1800hrs – two-and-a-half hours for CMBT-Vellore seemed high to me. I had done this journey in exactly two hours in a TNSTC Volvo a couple of years back. I got worried if this bus would reach Bangalore on time. 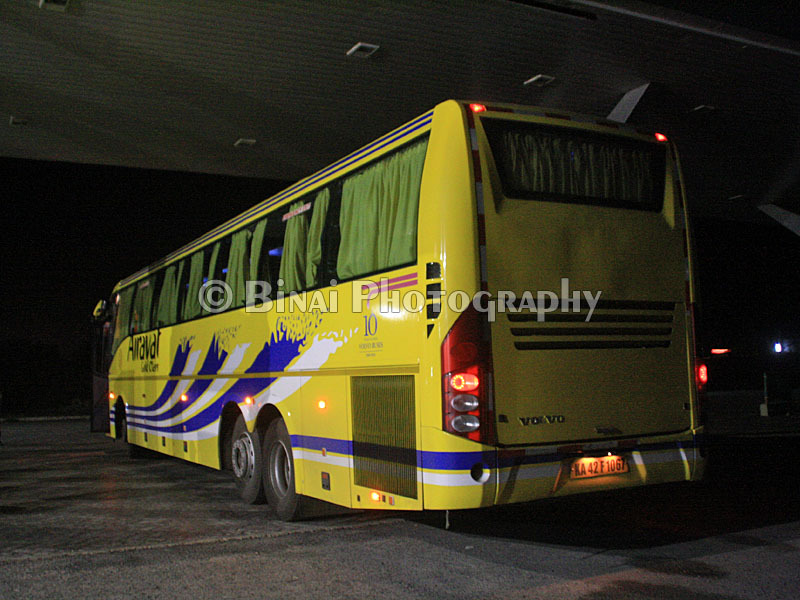 We kept crossing a lot of Chennai bound Volvos – the frequency of these buses increased after Vellore. We overtook an SRM B9R (The new Chennai-Bangalore day service) at Ambur – the SRM guys were stopping at every town looking for passengers. Our bus did not stop anywhere to search for more passengers. We stopped right after the Vaniyambadi toll gate for a quick break – there was tender coconut vendor at the place. I downed one and got back in to the bus. We started off at 1917. The second driver was still asleep. We passed Krishnagiri at 1955. The SRM bus was ahead of us now (they overtook us, when we stopped for a break). 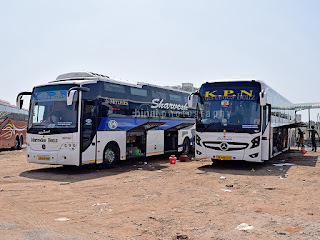 There was one Kallada B9R for company after Krishnagiri – I guess that was the day service bus coming from Trivandrum. The Kallada guys went ahead of us as we neared Shoolagiri. Our bus stopped for Dinner at Kamat Upachar, just past Shoolagiri (2035hrs). Unlike other hotels where buses stop, Kamat did not practice the “pre-paid” policy. Food was served fairly fast, since they offered limited menu for bus passengers. The bus was locked as all passengers got off. The conductor opened the doors (by entering through the driver door) only when there were passengers waiting to get back in – this kept the baggage safe! We started from Kamat at 2109hrs – the break took 34 minutes. Bangalore terminating buses would usually not have this break, but they’d stop for evening tea instead. The first driver continued even after the break, while the second guy headed to the last row again! The movie was switched off after the break – they played two-and-a-half movies! All the movies were bollywood ones – really appreciated for an inter-state route. We crossed Hosur at around 2140 – a couple of passengers got off here. The bus lost a lot of time at the Attibele toll gate - heavy traffic, plus wrong selection of toll lane jammed us in. A couple of passengers got off at Electronic City (2209hrs). I was dropped at Bommanahalli at 2220hrs. That was 6hours and 50 minutes, from Chennai Koyambedu to Bommanahalli, including a 34 minute break. Not really bad considering the fact that the bus did not go beyond 90kmph at any point of time. The bus was young, and well kept. 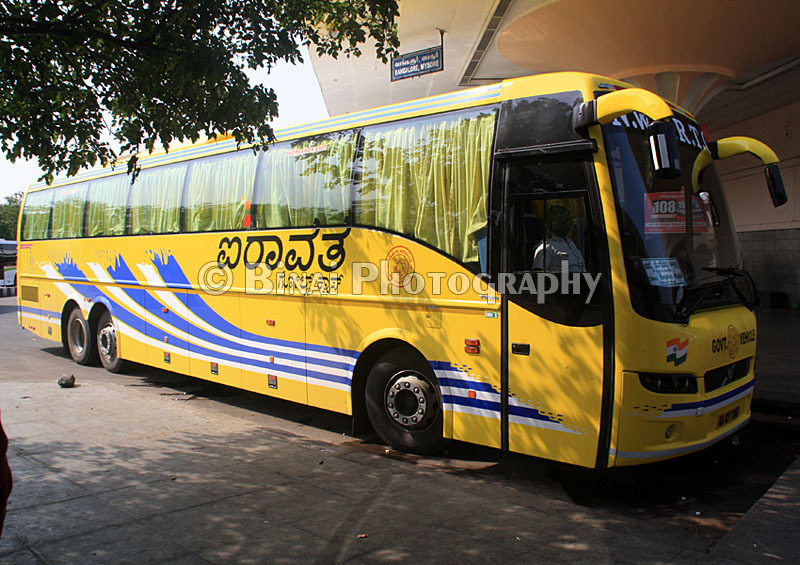 The crew were really friendly – all of them spoke Kannada and Hindi. The conductor spoke English as well. They did not mumble when passengers asked them to be dropped at certain specific points – the conductor helped passengers to take the luggage out as well. The only thing I did not like about the bus is the low leg-space – the legroom is same as that of the regular Airavats, but not anywhere near that of the Airavat Club Class (thanks to one extra row of seats). The bus is excellent for day journeys – night run might be tight. The crew behaviour was top class. The driving style was really good. Absolutely no rash overtakes, and he did not lug the engine at all. I’d recommend this service. Quite a detailed account. Useful, thanks! Appreciate such detailed comments and balanced too.